That’s the grown-up Jesus, though. What about the child Jesus? 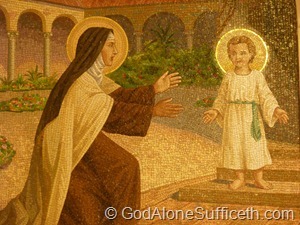 St Therese, after all, is St Therese of the Child Jesus. Staying behind in Jerusalem strikes me as a not-nice thing to do–as the parent of an almost-12-year-old boy, I can’t help but think it was a bit vexing for Mary and Joseph. Not having been a great fan of St Therese, I don’t know for certain, but I suspect that it wasn’t the 12-year-old Jesus that she had in mind. St Francis de Sales, in a series of letters published as Letters to a Wife and Mother, advises his cousin in her endeavor to life a holy and spiritual life in her ordinary, daily tasks. She gets discouraged; St Francis suggests that she go about her work imagining that she does everything as Our Lady might have done: holding the small hand of Jesus. St Francis offers to his cousin the presence of the Lord as a child. And there is something at once gentle and unyielding about that presence. The set of letters is well worth reading, especially if you happen to be a wife and mother. Even if not, St Francis gives advice so kindly that anyone would benefit from it. It is the sort of advice that fits very well with what I know of St Therese: in the small things, the everyday tasks, there are opportunities for grace, for love, for living in the presence of the Lord Jesus. Tenderness is not the way of our world, but it is required in the proper care for small children. And anyone who spends any time caring for small children will tell you that tenderness can be difficult to muster. Attending to the presence of the child Jesus is not a way out of the hard work of the spiritual life, but is a deepening of it. Not only is the Lord present to us as teacher and savior, but as child–not to be ignored or forgotten, or left in a corner, but taken by the hand and kept by our side. We have always been taught by the Lord in his vulnerability on the cross. Perhaps it is time for us to allow us to teach him through his vulnerability in those precious years between the presentation and the finding in the temple. St Therese, pray for us.